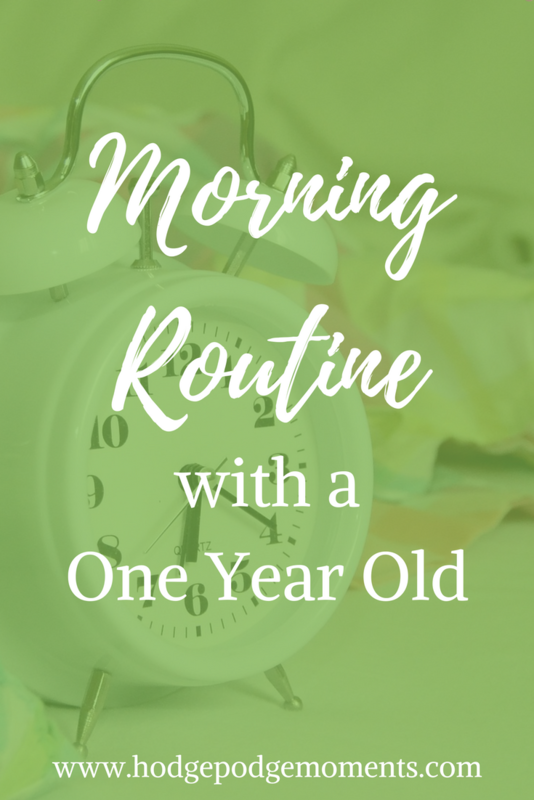 Having a morning routine with a one year old in the house might seem impossible, but I’ve found that it’s actually an essential part of our day. Our morning routine sets the tone for the rest of our day, which is why I wanted to share it with you today. As with most of our routines, I’ve kept it simple and flexible to accommodate changes. As you’re reading through our routine, keep in mind that my husband is in the military and works bizarre hours so I’m often the only one around during our morning routine. You’ll see this reflected in several spots where I mention how I keep Baby Fox entertained while I’m working on a necessary daily task. The first thing I do in the morning is wake up. Currently, I tend to wake up to the sound of Baby Fox starting to stir in the other room. We have a video monitor, which is helpful because it means that I can see when he’s actually awake. Ideally, I would like to be awake before him, but so far this hasn’t happened due to a variety of reasons. I typically let him wake up slowly while I take care of dragging myself out of bed and going to the bathroom. This might not sound glamorous or put together, but that’s okay – I’m simply not a morning person. After I take care of my personal needs, I head to the nursery to get the little one. Baby Fox is typically happy to see me when I open the door. He’s typically either playing with one of his stuffed friends or trying to sneak mini board books into bed. I tell him good morning as I take him out of his sleep sack. Then it’s time to visit the changing table for a fresh diaper. After I’ve taken care of Baby Fox’s hygiene, we head to the living room. If the dogs are super antsy, then I’ll go ahead and let them into the backyard. Then, it’s time for our morning nursing session. This is one of those things that will eventually be replaced, but for now, nursing is still a part of our daily lives. After I’ve made the baby happy with a diaper change and nursing session, it’s time to tend to the dogs. In order to do this quickly and with minimal distractions, I find an age appropriate show on Netflix for Baby Fox and let him enjoy it from the comfort of his rocker. Spending ten minutes in his rocker after a feeding is a habit that has carried over from when he was younger and we dealt with reflux. He’s outgrown his reflux problems, but I still think a rest period after eating is a good habit. While he’s enjoying a short show, I fill the dog bowls and call my furry friends in from outside. This is also the point in the morning where I take care of a few minor kitchen tasks – making coffee, emptying the dishwasher, and making sure things are ready for breakfast. Baby Fox used to play for a bit before heading to the kitchen for breakfast, but here lately, he seems ready for breakfast right after I’ve finished taking care of the dogs. So, I tend to go get him from the living room so that we can enjoy our first meal of the day together. He goes into his high chair while I get breakfast ready. He has special high chair toys and books that I give him while I prep our food. Sometimes we have a nice conversation (baby talk for him of course) and other times, we both enjoy our tasks in silence. Once the food is ready, we sit and enjoy it together. After breakfast, it’s time for playtime. At this point, we journey back to the living room and I pull out some toys. I’ll leave Baby Fox alone for five to ten minutes while I get the kitchen cleaned up. Our living room and kitchen are right next to each other and we have the living room set up to be baby safe. Once the kitchen is picked up, we continue with playtime. Sometimes he plays alone while I work on social media and other times, we play together. I’m working on making our playtime more intentional, especially now that he’s getting older. At some point in the morning, we sneak in a morning snack before naptime. I’ve found that this helps Baby Fox sleep better and allows for a later lunch. With his current nap schedule, we don’t seem to eat lunch until 1pm, so the morning snack seems necessary. Once we’re done with our morning snack, it’s back to playtime. Playtime is typically in the living room; however, we do venture off to other rooms as well including the nursery and our bedroom. We end our mornings with naptime. It took some time, but Baby Fox has finally adjusted to naptime and actually puts himself to sleep. We have a very simple routine that includes a clean diaper, his sleep sack, and a book of his choosing. After we’ve read the book, his sound machine gets turned on and he goes into the crib with his sleep friends. From there, it’s up to him to put himself to sleep. I keep an eye on him with our monitor and then work on the blog once he’s asleep. Our routine seems to be a constant work in progress. As Baby Fox grows and his needs change, our routine shifts to meet those needs. I’m sure our morning routine will continue to change over the summer as new goals come into play. We’ll continue to have a routine of some sort thought because it sets the tone for the rest of our day. Are you a morning person? What does your morning routine look like? Need a little help getting your morning routine under control? Check out Moments that Work, a twenty one day workshop that will help you improve your schedule. 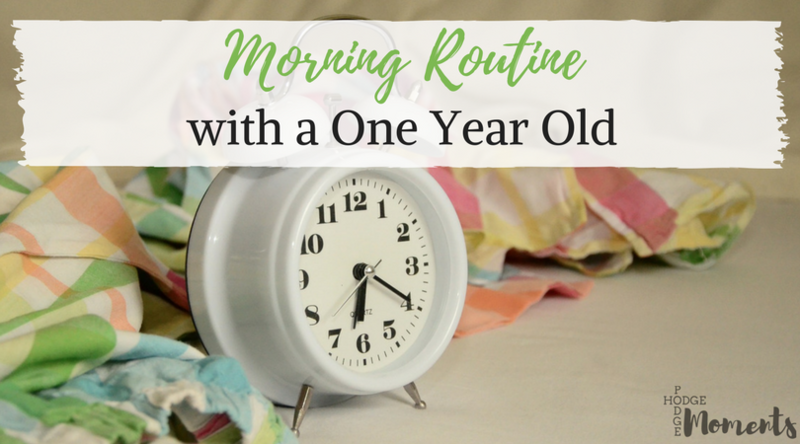 Routines with a one year old can be so hard but they are so important! I am currently living the struggle over here as well. lol! Thanks for great tips!